Have Some Modern Magicians Sold Their Souls To Demons? → Have Some Modern Magicians Sold Their Souls To Demons? RE: Have Some Modern Magicians Sold Their Souls To Demons? well I'm just calling out the people who say they have REAL magical powers. that may or may not exist, but I don't think these hucksters can get that type of power. paid/trained audience, CGI, Camera tricks, sleight of hand magic etc. should cover nearly all the bases. Evil is the absence of good, that means there is no substance to evil. I believe in some supernatural stuff. Check out the Marian apparitions.. these are LEGIT and LONG STANDING miracles and supernatural events. What's your opinion on the musical aspect of this "selling your soul" stuff? Kind of odd that guys like Carlos Santana, Jimi Hendrix, Jimmy Page, Bob Dylan, even Beyonce (the list goes on and on) have all either out right admitted the role of the demonic realm in the writing/performing of their music or were at least well known for practicing "witchcraft" of sort. (01-19-2015 04:26 AM)EVILYOSHIDA Wrote: Evil is the absence of good, that means there is no substance to evil. That's an interesting philosophy. But doesn't jive with the Biblical take, of course. 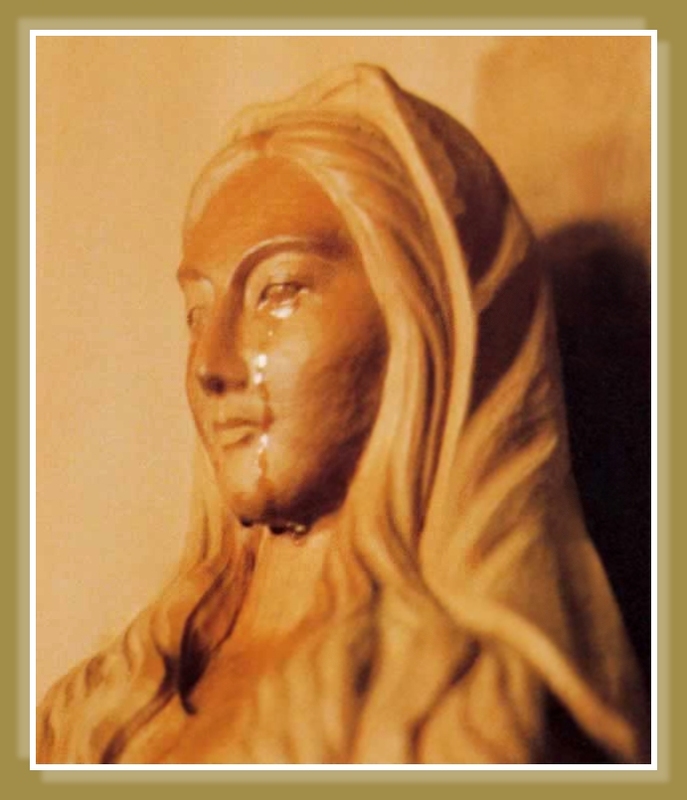 Quote: to date only one single example of a combined weeping statue and apparition (namely Our Lady of Akita) has been approved by the Vatican and the rest have usually been dismissed as hoaxes. An unusual nature of the Our Lady of Akita apparitions was that unlike other cases the entire nation of Japan was able to view the tears of the statue of the Virgin Mary on national television. this one has not been debunked and out of the thousands of weeping statues is the only one approved by the Vatican. It would not make sense for these hucksters to have supernatural powers. Fatima Miracle. Thousands of people saw it at the same time. This one is hard to debunk. it would make sense for only the most high to have these types of powers. Internet hucksters would not have real supernatural powers. none of this happens in professional competition with real audiences and sanctioning bodies. these magicians could be making much more money as an NFL rb or fifa striker by running through people. or how about a boxer that evades punches by having it go through his body. etc etc etc they would also have a much much larger audience to preach to. It's possible that while they don't have supernatural powers themselves, they allow the familiar spirit to take over their body by possession. That is exactly what musicians like Beyonce and dude from AC/DC (forget his name) have said about having total memory loss on stage or out of body experience while performing and in Beyonce's case even giving a name to this alter ego that takes over. Just like the magician from the America's Got Talent vid i posted. Why is it that most of the world's most powerful people, or the world's most famous musicians have links in one way or the other to channeling of spirits, satanism, the occult, etc.? No pun intended...but where there is smoke there is usually fire. I believe some people can channel or be psychic etc. I also think people can tap into demonic psychological states as with the musicians you cited. I don't think these guys can break the laws of physics though. I agree. If you just watch these vids and assume there is no CGI or camera editing, the it looks like real magic. These guys are actually using composites, several takes, fake audiences etc. that explains everything. (01-19-2015 04:39 AM)EVILYOSHIDA Wrote: Fatima Miracle. Thousands of people saw it at the same time. This one is hard to debunk. What some in the crowd saw at Fatima was that the sun was moving a bit and had coloration effects. Quote: Auguste Meessen, a professor at the Institute of Physics, Catholic University of Leuven, points out that looking directly at the Sun is known to cause phosphene visual artifacts and temporary partial blindness. Meessen contends that retinal after-images produced after brief periods of sun gazing are a likely cause of the "dancing" effects, and the colour changes were caused by the bleaching of photosensitive retinal cells. Meessen observes that solar miracles have been witnessed in many places where people have been encouraged to stare at the sun. He cites the apparitions at Heroldsbach, Bavaria, Germany (1949) as an example where exactly the same optical effects as at Fátima were witnessed by more than 10,000 people. How do you know someone like Lebron James hasn't already showcased demonic magic? The idea is that it must remain veiled or else everyone would know that the supernatural exists for sure and be forced to choose a side. This is not what the demonic realm wants, I would assume. We've all heard the saying, "the greatest trick the devil ever played was convincing people he didn't exist"